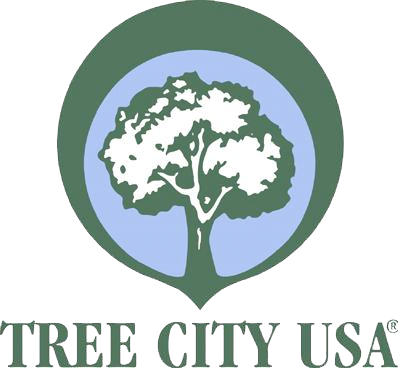 Tree City USA® program, sponsored by the Arbor Day Foundation in cooperation with the USDA Forest Service and the National Association of State Foresters, provides direction, technical assistance, public attention, and national recognition for urban and community forestry programs in thousands of towns and cities across America. Benefits include: creating a framework for action, education, a positive public image, citizen pride, potential preference in financial assistance and positive publicity. A Tree Board or Department - A tree board, or commission, is a group of concerned volunteer citizens charged by ordinance with developing and administering a comprehensive tree management program. Balanced, broad-based community involvement is encouraged. Boards function best if not composed entirely of tree-related professionals such as forestry professors, nursery operators, arborists, etc. Fresh ideas and different perspectives are added by citizens with an interest in trees that is entirely vocational. Limited and staggered terms of service will prevent stagnation or burnout, while at the same time assuring continuity. A Tree Care Ordinance - The tree ordinance must designate the establishment of a tree board or forestry department and give this body the responsibility for writing and implementing an annual community forestry work plan. Beyond that, the ordinance should be flexible enough to fit the needs and circumstances of the particular community. A tree ordinance provides an opportunity to set good policy and back it with the force of law when necessary. Ideally, it will provide clear guidance for planting, maintaining and removing trees from streets, parks and other public places. A Community Forestry Program With an Annual Budget of at Least $2 Per Capita - Evidence is required that the community has established a community forestry program that is supported by an annual budget of at least $2 per capita. At first, this may seem like an impossible barrier to some communities. However, a little investigation usually reveals that more than this amount is already being spent by the municipality on its trees. If not, this may signal serious neglect that will cost far more in the long run. In such a case, working toward Tree City USA recognition can be used to re-examine the community’s budget priorities and re-direct funds to properly care for its tree resource before it is too late. Ideally, this standard will be met by focusing funding on an annual work plan developed after an inventory is completed and a report is approved by the city council. Such a plan will address species diversity, planting needs, hazardous trees, insect and disease problems and a pattern of regular care such as pruning and watering. An Arbor Day Observance and Proclamation - This is the least challenging and probably the most enjoyable standard to accomplish! An Arbor Day celebration can be simple and brief, or an all-day or all-week observation. It can be a simple tree planting event or an award ceremony that honors leading tree planters. For children, Arbor Day may be their only exposure to the green world or a springboard to discussions about the complex issue of environmental quality. Arbor Day is a golden opportunity for publicity and to educate homeowners about proper tree care. Utility companies can join in to promote planting small trees beneath power lines or being careful when digging. Smokey Bear’s fire prevention messages can be worked into the event, as can conservation education about soil erosion or the need to protect wildlife habitat. For more information, please visit the Arbor Day Foundation.